Find the perfect kennel for your pet. Every dog needs a home of its own. For outdoor dogs, dog kennels are essential. If your dog stays inside, that could be a crate, a dog bed in a corner of the room, or even a favourite spot under your bed. Your dog's kennel should be designed to protect your dog from bad weather, keeping him warm in the cold, dry in the rain, cool in the heat, and generally happy and safe! Remember out door dog kennels are not for all breeds. There are kennels to suite all tastes from simple traditional designs to log cabins and castles! Ideally there should be a place for water and food bowls. Inside the dog house they are protected but must be secure to avoid tipping over! The door height opening should be no less than 3/4 of the dog's shoulder to ground. Large doors aren't necessary, dogs typically duck to enter a doghouse. The width and length measurement of the house should be the same as or no more than 25% larger than the nose to flank (Tails don't count). The height of the doghouse should be at least 25% (no more than 50%) taller than the height of the top of the dog's head to his toes. Again, this house measurement can exceed the dog's total height up to 50% and still maintain a good body heat retention factor during cold months. An attractive and versatile home fits dogs up to 75 lbs. Snaps together quickly with no tools needed. Lifetime guarantee against cracking and breaking. 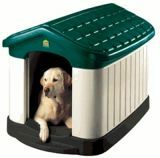 Insulated dog house in an Igloo-style features an adjustable air vent and offer a five-year manufacturer's warranty. Build your own dog kennel. Imagine the feeling of satisfaction you'll have when your dog curls up peacefully in the dog house that YOU built for him. Several sizes and styles available.